We’d love your help. Let us know what’s wrong with this preview of Forks, Knives, and Spoons by Leah DeCesare. To ask other readers questions about Forks, Knives, and Spoons, please sign up. As a child of the 80s, I was instantly smitten with the time period of this novel and all the pop culture references peppered throughout. I had forgotten about many of those things and had so many “aww” moments that I waxed nostalgic over and over. The group of women in this novel were in college, so there was also some college nostalgia, too. It’s all very fun, but it’s not fluff. There is plenty of substance to the story, and what the characters work through. This is a smoothly written story about friendship that was a delight to read! I plan to re-read it at some point when I’m ready to visit the 80s again! Thank you to Leah DeCesare for the complimentary copy in exchange for a review. Amy York is leaving her Connecticut home to begin her freshman year at college. Her father provides her with light advice on choosing a life partner before she leaves. One of his hopes is that she selects a boyfriend that will not distract her from the dream she has of becoming a journalist. His advice classifies men into three types of utensils: forks, knives, and spoons. Amy takes this advice to heart, providing her with a guide to assess the male population at college and beyond. Amy and Veron Amy York is leaving her Connecticut home to begin her freshman year at college. Her father provides her with light advice on choosing a life partner before she leaves. One of his hopes is that she selects a boyfriend that will not distract her from the dream she has of becoming a journalist. His advice classifies men into three types of utensils: forks, knives, and spoons. Amy takes this advice to heart, providing her with a guide to assess the male population at college and beyond. Amy and Veronica meet at Syracuse University and quickly become best friends. Amy passes along her father’s wisdom to her friends and they all put it to use. It justifies tough breakups, why a relationship went sour, or just to size up someone at a party. The book takes us through the two friends college journeys as they delve through relationships, skepticisms, spring breaks and formals. Amy leaves school with a boyfriend she hopes to marry while Veronica is still looking for that perfect utensil. The two move to New York City and share an apartment. Amy continues her relationship with her boyfriend, Andrew. She begins to slowly learn that the ideal utensil from college may not be the best fit for her current needs. Veronica becomes serious about her boyfriend Joey who never finished college. Whenever she visits her parents in Rhode Island, her mother tries to set her up with young men from her social circle. Veronica struggles with introducing Joey to her parents fearing they will not approve of him based upon her upbringing. The book follows their relationships while they mature into adulthood through new apartments, weddings of friends, and jobs. The characters in this book are very likeable and their friendship is written realistically. The book has an easy flow and I was taken back in time to the period of being in college and embarking on a career. I enjoyed the references to the ‘80’s / ’90’s: Benetton sweaters, Denise Austin videos and Mulholland Drive Cafe owned by Patrick Swayze. I will look at my utensils very differently now! Although, I did feel like Amy was trying too This is a great read. If you are looking for a relationship than you really could use the concept of finding the perfect "steak knife". Don't settle for anything less. Otherwise, you are just left with a bunch of posers. Amy and Veronica were good together. I enjoyed seeing them experience all of their relationship turmoil in their quests to find the perfect "steak knife". They did come across forks, spoons, sporks, and even chopsticks along the way. Even though I am not a big fan of romance novels, I absolutely loved this book. I adored the way that the characters used the Utensil Classification System to rate the quality of the boys that would come in and out of their lives. This book is an amazing collage of wit, funny college life, romance, and finding Mr. Right. I loved the way that it followed the relationships of the protagonists and showed what to look for and what to keep away from in a guy. I won this book through a Goodreads giveaw Even though I am not a big fan of romance novels, I absolutely loved this book. I adored the way that the characters used the Utensil Classification System to rate the quality of the boys that would come in and out of their lives. This book is an amazing collage of wit, funny college life, romance, and finding Mr. Right. I loved the way that it followed the relationships of the protagonists and showed what to look for and what to keep away from in a guy. This was such a fabulous book! I could not put it down! I have read it twice and it just keeps getting better! As a child of the 80s and who went to college in the early 90s, I loved how this novel took me completely back in time. Leah Decesare navigates the complexities of college relationships and the coming of age of two roommates as they move from underneath the wings of their parents and into the world of adult life. It's funny, witty and full of nostalgia. A perfect summer read to warm your heart. This book just wrapped me up into a big ball of 90s nostalgia and rolled me in first love memories! I didn't want to put it down. It tugged at all my heart strings and made me fondly remember why I'm so glad to be an adult hahaha. Raised alone by her father, after her mother died when she was an infant, he told Amy that all men were like forks, knives, or spoons. Amy takes this to heart and creates a class system that all men can somehow fall into. To her and her friends, ideal man is a shiny st This book just wrapped me up into a big ball of 90s nostalgia and rolled me in first love memories! I didn't want to put it down. It tugged at all my heart strings and made me fondly remember why I'm so glad to be an adult hahaha. Raised alone by her father, after her mother died when she was an infant, he told Amy that all men were like forks, knives, or spoons. Amy takes this to heart and creates a class system that all men can somehow fall into. To her and her friends, ideal man is a shiny steak knife. This story follows Amy and her closest friends as they navigate college, friendship, and love. Loved loved loved this book. I was taken on a journey back to when I was in college. I smiled, laughed and cried through the book. I didn't want it to end!! Forks, Knives And Spoons is a whole new way to look at dating through a college girl's eyes! It's 1988 in Syracuse, NY and Amy has just started her freshman year of college. Amy and her roommate, Veronica quickly become friends but Amy has this new way of classifying boys that Veronica doesn't agree with. The ultimate catch is a Knife, Forks are pricks and Spoons are the nerdy dudes. As Amy and Veronica get through the hard years of college, following this system of meeting boys and discovering Forks, Knives And Spoons is a whole new way to look at dating through a college girl's eyes! It's 1988 in Syracuse, NY and Amy has just started her freshman year of college. Amy and her roommate, Veronica quickly become friends but Amy has this new way of classifying boys that Veronica doesn't agree with. The ultimate catch is a Knife, Forks are pricks and Spoons are the nerdy dudes. As Amy and Veronica get through the hard years of college, following this system of meeting boys and discovering what kind of a boy they truly are. With the both of the girls coming into their own and finding that not everyone is what they seem. We are left with Amy and Veronica finding their own Knifes in a field of Forks & Spoons!! I loved this book and I so wished that a sequel was in the works just to check in on the girls like 5 years in future! The idea of this book appealed to me but I was a little apprehensive when I first started reading but I soon fell in love with how this story was being played out. I really liked how being set in the late 80's was totally perfect for what this story was saying. The bottom line is that I really loved this book and I could totally see this book being made into a 3 hour long movie!! Thank You to Leah DeCesare for writing a fantastic debut fiction novel that I can't wait to see what is to come from you in the future!! What an absolutely delightful, sparkly and fun read! Set during the time I basically went to college (give or take a few years), it was extremely nostalgic and took me right back to my college days. Freshman year, rushing a sorority, making new friends, entering the dating life... fast forward to senior year and embarking on new adventures... to later in life when you really "grow" up and learn about yourself. This is an honest look into how a classification system is used to find that "perfect" What an absolutely delightful, sparkly and fun read! Set during the time I basically went to college (give or take a few years), it was extremely nostalgic and took me right back to my college days. Freshman year, rushing a sorority, making new friends, entering the dating life... fast forward to senior year and embarking on new adventures... to later in life when you really "grow" up and learn about yourself. This is an honest look into how a classification system is used to find that "perfect" someone - in this case, a steak knife. I'll admit, I found it slightly annoying at first with the continual classification system... so I felt a kinship with Veronica when she would tell Amy to chill out with it or roll her eyes at the process. However, as I continued to read, it grew on me. I'm not saying I USE the system.... but I'm not saying it doesn't pass through my head sometimes... 😉. I absolutely adore Amy's relationship with her father. This is reminiscent to my own relationship with my father. Especially at the very end. The tried and true types of people are riddled throughout the book. Each personality shining in their own way. The plot is fairly transparent and you already know what the outcome will be and where the book is headed. Leah has you pinned though - you just want to see how each of these characters get there! Never settle. Never give up. And remember, fork is just another four letter word. 😜 Highly recommend. I look forward to more work from Leah and hope this book brings a big a smile to your face as it does to mine. Really was a fun read but gets you thinking about relationships, motives and personalities. It is also a great walk down memory lane for those who were of dating age in the 80s. This was a fun read! I really enjoyed the 80s setting because I grew up in the 80s. Sometimes it's nice to read a book like this, to bring me back to the good old days! The characters in the story were interesting and I wanted to see how they would work through things, and that definitely kept the pages turning. I loved all the 80s and 90s references throughout also! Thank you to the author for sending me a copy, I would definitely recommend!! I'm so happy to know Leah and to have had the chance to read her wonderful book in advance! It is a fun and charming story about college, friendship, and love. DeCesare follows two young women Amy and Veronica as they navigate Syracuse and Manhattan, trying to determine if the men in their lives are forks, knives, or spoons. A really fun read! "Forks, Knives and Spoons" is fortunately not a simple romance novel and I'm so happy for reading it! Leah's writings are extraordinary unique and the characters she has created in this masterpiece are very well connected, I could feel them and understand them in the best way! So I'm not the biggest fan when it comes to romance but this novel really gave me nice vibes, it merges the college life and romance in a very professional way that Leah could make! The main character is Amy a very interes "Forks, Knives and Spoons" is fortunately not a simple romance novel and I'm so happy for reading it! Leah's writings are extraordinary unique and the characters she has created in this masterpiece are very well connected, I could feel them and understand them in the best way! So I'm not the biggest fan when it comes to romance but this novel really gave me nice vibes, it merges the college life and romance in a very professional way that Leah could make! The main character is Amy a very interesting girl raised only by her father, after her mother died when she was an infant, and her father told her that all men were like forks, knives and spoons. The novel has a lot of funny acts, and also emotional ones, you can cry and smile in the same time, I really didn't want to end the novel I just wish there were more pages because the Author has the ability to keep your mind in the lovely character's life! Amy starts the college and there she meets her new friend Veronica and she tells about the advice her dad left her with! The book continues with their graduation and moves to NYC focusing mainly in their dating part of their life with a lot of funny parts and very emotional ones! Reading a very strong friendship bond is very beautiful and I love these novels, I really love the way that the Author has written so rare things about their friendship! I had high hopes going in to this book! It had great review on Amazon and the utensil classification system intrigued me. I was ready for the 80's pop culture references. I was disappointed. I thought the UCS was lame, and after a strong start, the pop culture references were few and mostly about music. I didn't find it laugh out loud funny and felt it wasn't very well written. I couldn't put this book down! Brought me back to my college and recent graduate days. This is a book that anyone can relate to - falling in love, heartache, family drama, career decisions and more. Every high school and college graduate should be reading this book - such valuable life lessons. Highly recommend!! The characters were alive. I was drawn to them. I liked them. They were real, flawed, and caring. I could feel the way they felt about each other and shared in their frustration, disappointment, healing, and happiness. I still think about them and wonder how they're doing. Easily read, hard to put down. I can't finish this book, the writing is flat and sophomoric and the premise of the rating system doesn't even make sense, totally contrived with little rationale. I can't understand all the good ratings. A great read! I laughed, I cried, I reminisced. Leah DeCesare hits all the right elements in her debut novel! So fun & full of nostalgia! A great summer read. This book was amazingly adorable. Set mostly in the 80s, it follows Amy through college, where she fits all men into the groups of forks, knives, and spoons according to the advice her father gave her before her freshman year. The book has amazing cultural references and Amy's system quickly catches on with the rest of the girls at school. Are there more utensils out there? Will they all find their steak knives? Or is it all a farce. Delightfully fun to read, a great book for your poolside readi This book was amazingly adorable. Set mostly in the 80s, it follows Amy through college, where she fits all men into the groups of forks, knives, and spoons according to the advice her father gave her before her freshman year. The book has amazing cultural references and Amy's system quickly catches on with the rest of the girls at school. Are there more utensils out there? Will they all find their steak knives? Or is it all a farce. Talk about a book I could not put down. My Kindle was coming everywhere with me while I was reading Forks, Knives and Spoons. Even while waiting in line at a drive through, I pulled out my Kindle to keep reading. I loved the story of a college friendship between two women, their relationships, and their life after college. The early 90s nostalgia had me smiling as well, and if you’re a 90s child, I bet you’ll get a few throwback laughs as well. I was surprised to see this is Leah DeCesare’s debu Talk about a book I could not put down. My Kindle was coming everywhere with me while I was reading Forks, Knives and Spoons. Even while waiting in line at a drive through, I pulled out my Kindle to keep reading. I loved the story of a college friendship between two women, their relationships, and their life after college. The early 90s nostalgia had me smiling as well, and if you’re a 90s child, I bet you’ll get a few throwback laughs as well. I was surprised to see this is Leah DeCesare’s debut novel, as it was extremely well-written, well-organized and kept me hooked from the first page to the last. I highly recommend you add this to your reading list! This book begins with Amy and Veronica starting their freshman year at Syracuse. Before Amy left home her father gave her some advice about boys. Veronica and Amy dub this unique advice the UCS. The Utensil Classification System.This story follows Amy and Veronica as they navigate the dating scene through college and beyond. Their decisions and actions cause a domino effect on their lives and others. I enjoyed these young ladies. Both seem to have a good head on their shoulders, even though they This book begins with Amy and Veronica starting their freshman year at Syracuse. Before Amy left home her father gave her some advice about boys. Veronica and Amy dub this unique advice the UCS. The Utensil Classification System. This story follows Amy and Veronica as they navigate the dating scene through college and beyond. Their decisions and actions cause a domino effect on their lives and others. I enjoyed these young ladies. Both seem to have a good head on their shoulders, even though they sometimes make a few stupid decisions. I chalk that up to youth. I love how the author sprinkles in many details from the 90's, especially the music. I found myself singing songs from my past! She even mentions Danielle Steele....oh my, she was a staple for me during the 90's. There are a lot of characters to keep up with and it can be overly dramatic in places. But the funny wit and the grand time had by all as they struggle to find the perfect steak knife, is such a treat. This is a heart warming read about relationships and life changing decisions. A real joy! "Be sure you know yourself and what's in your heart. Remember, you have to value and love yourself first." Women’s fiction sometimes gets a bad rap. Chick lit is often used in a derogatory way; the books we aren’t supposed to like. I don’t agree with the negative stereotypes associated with it, and if you ever meet me in person I’ll give you my whole diatribe about it. There are poorly-written pieces of literary fiction and great chick lit books. I will read it all! As much as I enjoy a well-placed women’s fiction novel, I hadn’t read one in awhile. Then Leah DeCesare’s Forks, Knives and Spoons lande Women’s fiction sometimes gets a bad rap. Chick lit is often used in a derogatory way; the books we aren’t supposed to like. I don’t agree with the negative stereotypes associated with it, and if you ever meet me in person I’ll give you my whole diatribe about it. There are poorly-written pieces of literary fiction and great chick lit books. I will read it all! As much as I enjoy a well-placed women’s fiction novel, I hadn’t read one in awhile. Then Leah DeCesare’s Forks, Knives and Spoons landed on my nightstand, and I am so glad it did! This is good, fun women’s fiction, and was a surprise hit for me. As many people have said, this book is a total nostalgia fest, and it was a lot of fun to re-visit college (in a different decade), but not why I loved Forks, Knives and Spoons. The initial utensil labeling system (or UCS in the book-Utensil Classification System) is a little silly, but DeCesare uses it as a jumping off point for the rest of the book. It is referenced throughout, but the relationships between Amy and Veronica and the girls and their boyfriends are the main event. There is some mild-mannered romance, of course, but the female relationships are just as important to the story. That being said, I did find myself, surprisingly, drawn into the college romances and drama, as well as the friendships, as if they were my own, and once I got into it I couldn’t put the book down. 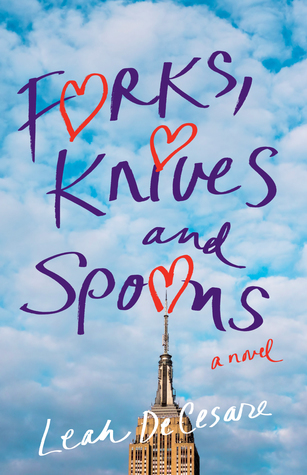 If you enjoy reading women’s fiction or watching romantic comedies like Love Actually and When Harry Met Sally, I really think you’ll love Forks, Knives and Spoons. It fits perfectly into that romantic comedy category. The plot is predictable, but that didn’t make it any less enjoyable. This was the perfect book to end summer with, but I think it makes a great fall read too. A blanket, some hot chocolate, and this great escapist book (perhaps paired with watching Love Actually or Legally Blonde) would make for a cozy fall evening. It’s only a matter of time until Reese Witherspoon options the film rights for this one . . .
loved everything about Leah DeCesare's novel "Forks,Knives and Spoons"! The concept of this novel is so unique, creative and unusual! Kudos to Leah DeCesare for such an amazing and original storyline! The genres of this story are Fiction, Women's Fiction, and Romance. The time-line of the story is in the 1980's where there aren't cell phones, texting, and social media. 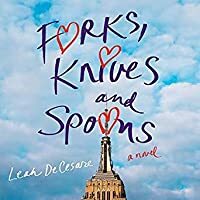 Imagine having to call on a landline or send a handwritten,(or typed) note or letter, The author describes several girls who bec loved everything about Leah DeCesare's novel "Forks,Knives and Spoons"! The concept of this novel is so unique, creative and unusual! Kudos to Leah DeCesare for such an amazing and original storyline! The genres of this story are Fiction, Women's Fiction, and Romance. The time-line of the story is in the 1980's where there aren't cell phones, texting, and social media. Imagine having to call on a landline or send a handwritten,(or typed) note or letter, The author describes several girls who become friends during college life. As Amy York's father has the "talk" before she goes to college, her father describes that there are three types of guys," Forks, Knives and Spoons." Amy uses this "Utensil Classification System" as a guide. Her college friends tend to refer to this as "UCS" Spoons would be nerdy, Forks would be the charming, love and leave them type, and Knives would be keepers. The characters are mostly likeable. These are college age and young adults finding their way through their adventures in college. I love the way that the author shows us how the characters deal with betrayal, dishonesty loyalty and commitment. I also enjoy how the girls use the Utensil Classification System. For example, this is an enjoyable quote minus the person's name not to spoil anything:" He turned out to be a fork in a knive's clothing". Leah DeCesare is the award-winning author of FORKS, KNIVES, AND SPOONS, her debut novel, and the nonfiction parenting series NAKED PARENTING, based on her work as a doula, early parenting educator, and mom of three. Her articles have been featured in The Huffington Post, Eligible Magazine, Simply Woman, the International Doula, and The Key, among others. She is the cofounder of the nonprofit, Doul Leah DeCesare is the award-winning author of FORKS, KNIVES, AND SPOONS, her debut novel, and the nonfiction parenting series NAKED PARENTING, based on her work as a doula, early parenting educator, and mom of three. Her articles have been featured in The Huffington Post, Eligible Magazine, Simply Woman, the International Doula, and The Key, among others. She is the cofounder of the nonprofit, Doulas of Rhode Island, and she spearheaded the campaign to build a medical center in Kampala, Uganda.